Michele Cinque, 2018, 92 min. A film screening and discussion with director Michele Cinque and Kathrin Schmidt, in conversation with Carlo Invernizzi Accetti, Rajan Menon, Adam Tooze, and Nadia Urbinati. This event marks the launch of "Thinking Europe Now," a new interdisciplinary seminar series on European affairs convened by faculty from Columbia University and the City College of New York. 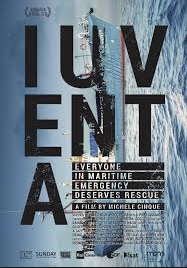 The documentary film Iuventa relates the events of a crucial year in the lives of a group of young Europeans involved in the Jugend Rettet humanitarian project, starting from the first voyage of the Iuventa ship to rescue over 2,000 migrants in the Mediterranean Sea, to the heavy accusations that led to the seizure of the vessel more than a year later. The backbone of the narration is the ship’s first trip out to sea: setting sail from Malta, she comes back to La Valletta after 15 days offshore, having saved the lives of over 2,000 people. After the first mission the film takes us to Berlin and in Italy in the months following the first voyage, through the winter time when the future of the Jugend Rettet is discussed. The film, precisely because of the particularly young age of its protagonists, becomes the tale of a sort of training period: finding themselves at the forefront of this horror and death, and conscious of the vastness and complexities of the correlated socio-political problems, these youngsters start having doubts about the sense of the whole project which, it appears, determines in some way the loss of their innocence. This event is co-sponsored by the Thinking Europe Now Seminar, the European Institute, the Columbia Maison Francaise, and the Columbia European Union Student Association.